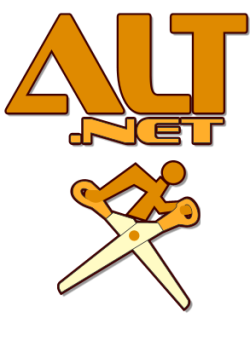 Next Saturday there will be another ALT.NET unconference in Stockholm. As before this is an open conference by developers for developers. This time we will open with some lightning talks. The last ALT.NET conference was a great success so if you have a chance to attend be sure to sign up. I have been playing with Silverlight the last few evenings, trying to port Roger Alsings "EvoLisa" application to Silverlight. This application is very cool, it uses a genetic algorithm to create an image composed of polygons that resembles a target image (that you can choose). I have been thinking of doing something like that for some time. I am very interested in artificial life and evolution simulations, especially after reading so many books on evolution by Richard Dawkins and others. The EvoLisa application is written in WebForms and uses the GDI Graphics object to draw polygons to a bitmap surface, it then does pixel level comparisons to check how close this generated image is to the target image. This proved to be very difficult to port to Silverlight as it was not possible access the pixel buffer of Silverlight WPF controls and surfaces. After hours of googling for 2D or 3D graphícs libraries for Silverlight I gave up and implemented a standard scan line polygon fill algorithm. It is not the simplest of algorithms, especially if you want to support complex polygons. Another issue was to to display the generated pixel buffer, this is also not possible. The only way to currently do it is through the Image control and encode you pixel buffer as a binary PNG stream which the Image control can then display. Luckily Joe Stegman had already figured this out, so I did not need to write my own png encoder. The last issue was also surprising, there is currently no way to read an image (client side) and access the pixels of that image. This is very easy to do server side with the Bitmap class, so instead of writing my own jpg/png decoder I send the target image to the server do the decoding there using the Bitmap class and then return the pixels as an array of bytes. This is only required once so there is no significant performance penalty for doing this. Hopefully Silverlight 3 will add more low level graphics APIs. You can see a screenshot to the right, this is just after two evenings of hacking, so the GUI is still very ruff. The performance is not completely on par with the WinForms version, probably because of the scan line polygon renderer is not as optimised as the GDI version (I think GDI is not hardware accelerated, right?). Last night I took a break from the Silverlight version because I just had to try to do the same but using WPF and Direct3D to render the polygons, I got something working but I don't know the performance benefit yet as it is currently only rendering at the monitor refresh rate. You clearly notice how the Silverlight version slows down as more polygons are added, this is something that I hope the Direct3D version will eliminate.